Have you ever felt lonely? Have you ever felt as though your friends and family had abandoned you? Have you ever felt like you were misunderstood? Have you ever had a hard time understanding or submitting to the will of God for your life? If so, then you have an idea of what the Lord Jesus went through as He agonized at Gethsemane. Hebrews tells us, “This High Priest of ours understands our weaknesses, for he faced all of the same testings we do, yet he did not sin. So let us come boldly to the throne of our gracious God. There we will receive his mercy, and we will find grace to help us when we need it” (4:15–16 nlt). The Bible tells us that Jesus was “a man of sorrows, acquainted with deepest grief” (Isaiah 53:3 nlt). But the sorrow He experienced in Gethsemane on the night before His crucifixion seemed to be the culmination of all the sorrow He had ever known and would accelerate to a climax the following day. The ultimate triumph that was to take place at Calvary was first accomplished beneath the gnarled old olive trees of Gethsemane. It is interesting that the very word Gethsemane means “olive press.” Olives were pressed there to make oil, and truly, Jesus was being pressed from all sides that He might bring life to us. I don’t think we can even begin to fathom what He was going through. But look at what it accomplished. It brought about your salvation and mine. Because of what Jesus went through at Gethsemane and ultimately at the cross, we can call upon His name. Though it was an unfathomably painful, horrific transition, it was necessary for the ultimate goal of what was accomplished. Maybe you are at a crisis point in your life right now—a personal Gethsemane, if you will. You have your will; you know what you want. Yet you can sense that God’s will is different. Would you let the Lord choose for you? Would you be willing to say, “Lord, I am submitting my will to Yours. Not my will, but yours be done”? You will not regret making that decision. Copyright © 2012 by Harvest Ministries. All rights reserved.Scripture taken from the New King James Version. Copyright © 1982 by Thomas Nelson, Inc. Used by permission. All rights reserved. “Do you value the teaching and encouragement you receive from A New Beginning with Greg Laurie?" 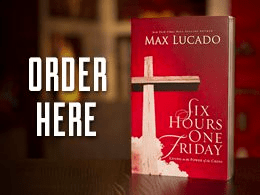 In Six Hours One Friday, Max Lucado conveys how God brought about the ultimate good from the suffering and death of Jesus Christ. A great pre-Easter read, Six Hours One Friday will be sent to you in thanks for your gift to Harvest Ministries today.